Looking for the best sewing machine can be a daunting task with all the remarkable products that are available in the market. The challenge becomes harder if you are in search of the best sewing machine under $500. Thankfully, we have just rounded up our best picks and did a review on each of them. This article will walk you through the top choices we have for the best sewing machine under $500. Plus, we will discuss the essential features each product offers so you will be able to assess which one is the ideal product for you. Out of all the notable products that are available in the market, we have picked two of our top choices. Best of all, these are both under $500. One of the top picks that we have come across is the SINGER 9960 Quantum Stylist Sewing Machine. This product is a computerized sewing machine that has 600 built-in stitches. This is perfect for all kinds of sewing projects. Additionally, it also carries 13 different kinds of presser foot that is easy to attach and remove. This product also features 13 kinds of buttonhole styles that you can simply choose from for your convenience. This gives the users the freedom to explore and be creative. This product is also equipped with automatic needle threading and speed control. This feature allows you to have more control over the sewing speed even with the absence of a foot pedal. This machine is also capable of reaching the maximum rate of stitches at 850 spm. Combining all these notable features, this product allows you to take on any kind of project you can think of. One of the key features of this product is that it offers 600 built-in stitches. This allows you to explore your creativity and also to work on a wide range of projects. These built-in stitches can be chosen based on the sewing project you are working on. Aside from the significant number of built-in stitches this machine carries, it also has 18 types of presser foot attachments. You can choose which type best suits the stitching style you desire. Each of the presser foot attachment can be quickly snapped on and off for your convenience. These include the Even Feed or Walking Foot, Straight Stitch Foot, Narrow Hem Foot, Blind Hem Foot, Satin Stitch Foot, and Zipper Foot to name a few. It also features 13 buttonholes styles that you can choose from. For easy stitching of buttonholes with perfect accuracy, place the button on the buttonhole foot, and it will do that trick. This means you don’t have to manually measure the size of the buttonhole before sewing it into the fabric. Another remarkable feature that this machine has is the Slider Speed Control. In using this, you can easily set the maximum stitching speed you want. For long seams, you can go faster, and for more intricate stitchings, you can go slower. It is very quiet and runs smoothly. The auto thread cutter works amazingly. The dog feed excellently feeds the fabric through. The LED lights work perfectly to provide a clear view of what you are working on. The embroidery stitchings are a bit too thin. There are no instructions for some of the features, so you need to explore how it works. Another product we have on our list is the SINGER 9985 Quantum Stylist. This is actually a newer version from the SINGER 9960. It features 960 built-in stitches that can cover for all your stitching demands. Additionally, it also has 13 types of presser foot attachments and 13 different buttonhole styles. This product has a maximum stitching speed of 850 stitches per minute. Combining all these definitely gives the user ease and convenience in the usage of the machine. You can begin any project with a breeze as it offers automatic needle threading. Moreover, it is also equipped with a large LCD touchscreen so you can easily view and change any stitching settings. Like the Singer 9960, the SINGER 9985 is also equipped with a vast variety of stitches you can choose from. To be exact, it carries 960 built-in stitches. The combination of stitches that you can opt for can be limitless. This machine also includes an impressive number of presser foot attachments which will depend on which type of stitch you desire. To be exact, this machine provides 13 different attachments for presser foot. These include the cording foot, walking foot or even feed, open toe foot, quarter inch foot, button sewing foot, narrow rolled hem foot, embroidery or darning foot, overcasting foot, satin stitch foot, blind hem foot, zipper foot, and the all-purpose foot to name a few. Like its lower version, this sewing machine is equipped with 13 different buttonhole styles. This gives you accurate, precise, and elegantly-styled buttonholes with every use. Selecting the specific type is as is a placing the button on the foot and choosing the style. Even without a foot pedal, you can easily control and set your desired speed. The reason for this is the Slider Speed Control which also another notable feature of this machine. Depending on the type of stitch, you can go fast or slow. The lettering stitches look great. It is very stable and sturdy. The throat space is big and spacious. The buttonhole feet works perfectly. It runs smoothly and can be operated with ease. There are some issues when sewing very thick fabric. The instruction manual is a bit hard to follow. Janome is one of the top brands when it comes to sewing machine manufacturing. With all the excellent products that they have developed, our top choice is the Janome HD3000 Heavy Duty Sewing Machine. This is a mechanical sewing machine that features 18 built-in stitches that the user can choose from. It has a very simple design but is housed in a very sturdy body. Plus, it does come with a hard carrying case. It has a turn dial for natural stitch selection and also features 5 presser foot snap on. Additionally, it also features an automatic needle threading system. All of which works for the advantage and convenience of the user. Furthermore, it is also equipped with an automatic thread cutting feature and a free motion dog feed. It has a maximum sewing speed of 860 stitches per minute. Best of all, it carries a 25-year limited warranty. One of the key features of this machine is its needle threader that operates automatically. You don’t have to worry about straining your eyes in trying to thread your needle. This machine can do that for you all the time. This will help you to do things quickly and efficiently. Another notable feature that this machine has is its very easy method of selecting stitches. This is all done by using a turn knob or a dial. You can select your desired stitching with just a turn, and the selected stitch type will appear on the stitch panel. This machine also has this remarkable feature of being able to adjust the pressure of its presser foot. With just a simple turn on the dial, this machine is able to change the presser foot pressure which allows it to sew through very thick fabrics easily. The bobbin winder works excellent. It is quieter than expected for a mechanical sewing machine. It can easily sew through multiple layers of fabric. The machine can handle heavy duty and a huge workload. It is easy to understand the way it operates. The hand wheel of this machine feels stiff on the first try. Not the best option for quilting. What To Expect in a Sewing Machine Under $500? Buying a sewing machine under $500 doesn’t mean that you are settling for a cheap piece of machine that nothing to offer. There are a significant number of products in the market that offer a handful of remarkable features and functions are an economical price. Here are some of the things that you would typically expect and get in a sewing machine under $500. It may be a sewing machine that is under $500, but it does not have to be something that is underperforming. When buying a sewing machine, even on a tight budget, you should expect it to include a significant number of stitches. The more built-in stitches the sewing machine has, the more efficient it will be. It means the machine can provide a wide array of stitching options to cover for any type of project you will be working on. Another important aspect that your sewing machine should have and what you should also look for are the stitch patterns. Check what type of stitch features the machine carries. These will often include straight stitches, buttonhole stitches, and blind hem stitches. The more stitch patterns it offers, the more advantageous it is for you. In addition to that, having more options when it comes to patterns means you can take on a wide range of projects. Aside from the number of built-in stitches and stitch patterns, your sewing machine should also typically include accessories such as presser foot attachments, a pack of needles, foot control or foot pedals, hard case cover, warranty card, and instruction manual. Finally, even if your sewing machine is under $500 doesn’t mean that it only has limited features. Some machines are packed with additional features like automatic threader, bobbin winding, thread cutter, and many more. Choose a sewing machine that offers more even at a budget price. In this way, you will be sure that you definitely got more for the value of your money. Which one is the Best Mechanical Sewing Machine Under $500? 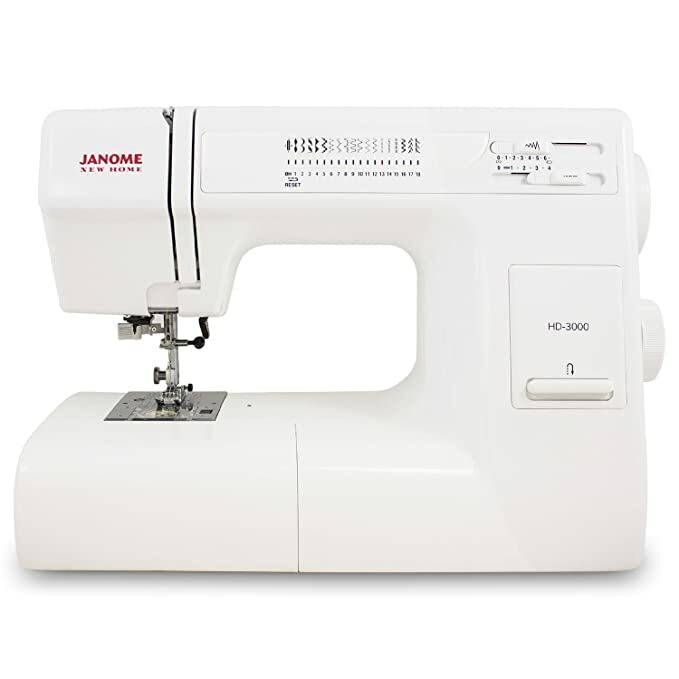 We find that the best mechanical sewing machine under $500 is the Janome HD3000 Heavy Duty Sewing Machine. Being a mechanical sewing machine, this product offers a whole lot of features that a user can take advantage of. For one, it is equipped with 18 built-in stitches. Additionally, it also has a maximum stitching speed of 860 stitches per minute. Furthermore, for selecting the type of stitch you desire, it has a knob dial for easy selection. It has a very simple and neat design but has a sturdy and solid body. It is also made to withstand heavy-duty projects and a massive bulk of the workload. Also, it can easily sew through thick fabric. Which one is the Best Computerized Sewing Machine Under $500? As for the best computerized Sewing Machine under $500, we opted for the Singer 9960 Quantum Stylist. Its an easy pick since this machine has a wide array of features and functionalities to offer. With 600 built-in stitches, this machine allows you to get creative and be able to take on any type of project. Plus, it also provides the 18 different presser foot attachment which will complement whatever type of stitch you desire. Additionally, this machine is also equipped with 13 types of buttonhole styles depending on which you pick for a specific project. For easy and straightforward dewing of buttonholes, this feature is a definite advantage. Furthermore, it also has a slider speed control feature. This allows the user to have control and be able to set the speed they want. For long seams, they can easily go faster, and as for more intricate and delicate stitches, they can always go slower. When it comes to the purpose of sewing machines, there are a variety of choices where it can be specifically used. As for the top sewing machine we picked for a specific type of project, here are our choices. 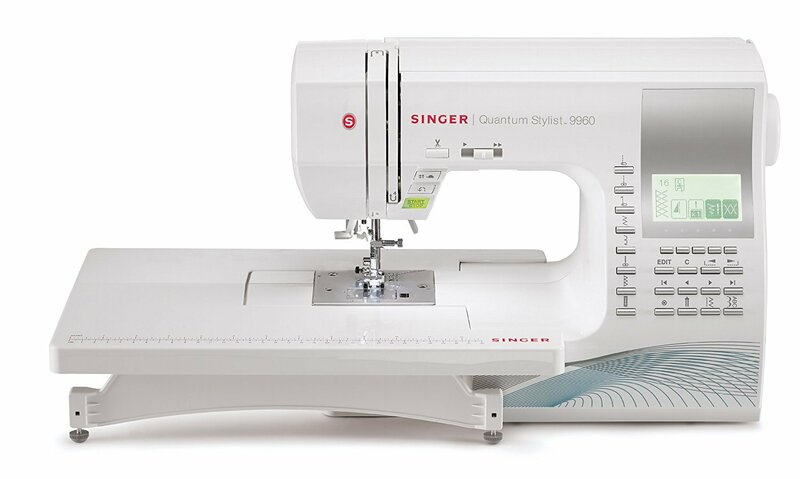 We recommend the SINGER 9960 Quantum Stylist as the best sewing machine for quilting. Not only is this machine easy to use even for a beginner, but it also has a sturdy body and an adequate space for quilting. Additionally, it also has 18 presser feet, 600 built-in stitches, and you have control over the stitch elongation, length, and even width. It also has 25 needle positions and automatic reverse. On our choice for the best sewing machine for Jeans and Denim, we picked the Janome HD3000 Heavy Duty Sewing Machine. This impressive machine is actually a mechanical sewing machine. It is designed with a simple and straightforward body. However, it may look simple, but this machine has a very solid and sturdy body. This machine includes 18 built-in stitches that can be easily selected using a knob dial. It has 5 attachments for its presser foot and a 5-piece feed dog. Additionally, it also has a maximum speed of 860 spm. It is also equipped with an automatic needle threader feature and auto thread cutter. It also had an adjustable functionality on the pressure of the presser foot. This feature allows the user to sew through very thick fabric. This is the reason why we recommend it as the best sewing machine for jeans and denim. 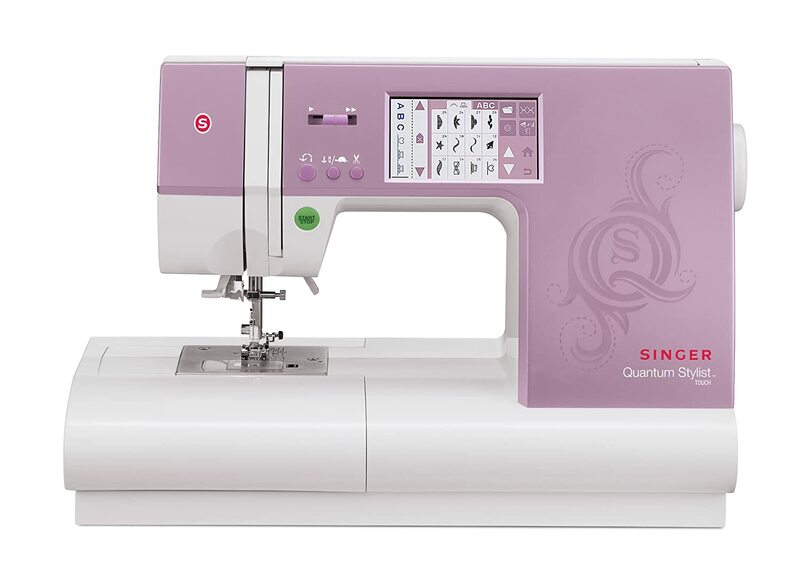 The SINGER 9960 Quantum Stylist in our opinion is the best sewing machine for crafts. With its 600 built-in stitches, users are provided with a wide range of stitches to choose from. It also has 34 decorative stitches as options. With these decorative stitches, you can definitely design all sorts of things with ease. It is also equipped with 5 varying fonts that is ideal for crafting a project. The user can select the font style easily via touchscreen LCD pad. Additionally, it also has a significant number of presser foot snap on. It carries 18 of them which includes fancy trim foot, darning and embroidery foot, satin stitch foot, and the single welt corning foot to name a few. Finally, for our choice on the best sewing machine for heavy-duty projects if none other than Janome HD3000 Heavy-Duty Sewing Machine. One of the reasons why we picked this machine as the best for heavy-duty projects is it’s built. This machine is built to last with its solid and sturdy. Additionally, it has a maximum speed of 860 spm. This means that this machine is capable of going through any heavy-duty projects smoothly. It has 18 built-in stitches which are perfect for catering for all the sewing needs. In addition to that, one remarkable feature of this machine is an adjustable presser foot pressure. This allows that machine to easily saw through thick and heavy fabric. In summary, we have the SINGER 9960 Quantum Stylist, SINGER 9985 Quantum Stylist, and the JANOME HD3000 Heavy-Duty Sewing Machine as our top picks for sewing machines under $500. Price wise, these products may be on a lower end of the spectrum, however, the features and offers that they have tells us otherwise. Despite the budget-friendly price, these products offer a significant range of features and functionalities that can benefit the user. We have recommended the SINGER 9960 Quantum Stylist to be the best computerized sewing machine that is under $500. It also our top choice for projects such as quilting and for crafting. This is because of its huge number of built-in stitches, presser foot attachments, and other notable features. Meanwhile, we picked JANOME HD3000 Heavy-Duty Sewing Machine as the best mechanical sewing machine under $500 as well as the best choice for projects such as sewing jeans and denims and for heavy-duty tasks. This is mainly because of its powerful motor and solid body that can take on any type of heavy-duty projects. Overall, these products provide users with a myriad of features and functions at a price that will not hurt their pockets. This just goes to show that you can get a product for the best value if you know what to look for.